Happy Sunday Everyone!!!! I can’t believe I’m finally back from a three month hiatus! In one breath it was a VERY quick three months, a vision of grilled food and cocktails on the deck, then in the next it was a VERY long three months as my little (big) guy went from a cranky baby to finally a baby who anyone would melt over. Don’t worry Sunday is still my favorite day of the week! I’ve missed my #SundaySupper crew, I’ve missed their delicious creations and their wonderful sense of style, creativity and the way they make me smile every week! 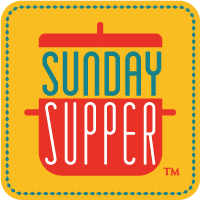 This week Lane over at Supper for a Steal is hosting this fabulous Sunday event! Yes that name sounds familiar to some of you because her and her blog were Featured Here and I cooked two of her yummy recipes! Thanks for hosting Lane! Sooooo what is today’s theme you ask?? Well the Fall is upon us, yes leaves are already falling, sports are changing over so what else besides tailgating season! What is your favorite tailgating food? Well anyone that knows me knows that me and football don’t get along. I’ve tried over and over again to like it, even to enjoy it, but I can’t. So instead, I enjoy that my husband loves it and I like to cook him and my sister snacks all through the season while they watch the games. Have I ever been tailgating? Well yes, but for concerts, so I guess that still counts. When I think about tailgating foods I know the yummies usually consist of awesomely marinated steak tip kabobs, Chicken skewers and maybe potato skins and some fabulous grilled veggies. Well how about for those of you that love to enjoy a good ol fashion tailgating food but would like to keep the calories down to a minimum? Well then this sandwich is for you. It doesn’t just have to be a girly sandwich! Guys don’t be intimidated you can dig in too! Throw it on a hamburger roll if you must! I love Chicken Caesar Salads, but who wants to truck along all the ingredients that go with it? Not me!! 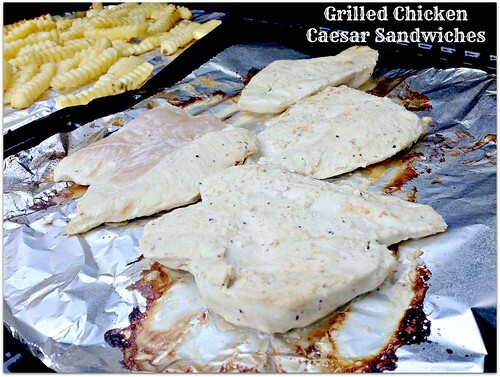 So let your chicken marinate in Caesar Dressing, throw it on the grill and slap it onto a sandwich with pre-cut tomatoes, and pieces of lettuce! Wala…….instant mouth watering sandwich without the hassle! Slice tomatoes, lettuce and shredded cheese into a separate zip-lock bag. Throw the bag of chicken and the pre-cut veggies/cheese into your tailgating cooler and off you go! Grill the chicken for 5-7 minutes, flip and grill on the other side until no longer pink in the middle. Meanwhile toast the buns for that crouton crunch of a caesar salad, layer with lettuce and tomato, add your cooked chicken, sprinkle with cheese and dab with a little extra dressing! Let’s see what else the #SundaySupper crew has brought tailgating with us this weekend!! I love grilled chicken Caesar salad, Tammi, so I know I would love your beautiful sandwiches. What a tasty idea! Enjoy the time with your two little ones. It goes so quickly you won’t believe it. Welcome back Tammi, thanks for participating! These sandwiches sound delicious! I love Caesar dressing and chicken. Yum! Now this is a great sandwich! I would love to munch on this while watching some football! Hi Tammi, welcome back! Caesar and chicken salad sandwich style works for me! Welcome back beautiful momma! So glad to see you doing this again. I can’t believe it’s already been 3 months… how is that even possible? He’s just so darn cute! xoxo momma! Oh wow!! Such a great, easy and fun recipe. Perfect for tailgating too! Great sandwich! A perfect one for grilling before the game. Welcome back, hon! What a great recipe back! LOVE these sandwiches! This is my kind of sandwich! Love Caesar anything! Those 3 months went fast. Welcome back!! This sandwich look so tasty. Grilled chicken Caesar is one of my favorite salads…I never thought to make it into a sandwich. Welcome back, Tammi! These sandwiches look just great, and I love that you used sub rolls for them. I make something similar with ground chicken patties (like hamburgers) and then all of the Caesar toppings for those. That’s a great idea too Lori! Will have to try that one! These look awesome! Love that you took chicken caesar and put it on a bun. Perfect for tailgating. What a delicious looking sandwich! 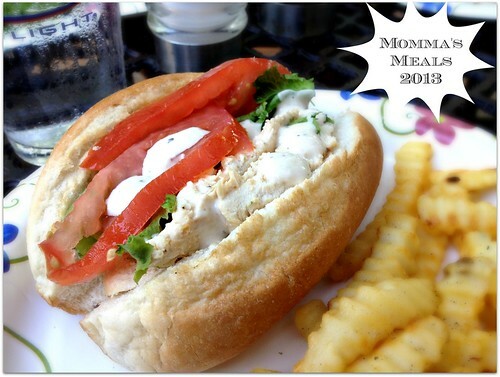 Those sandwiches look amazing–I love the idea of putting chicken caesar in a sandwich!